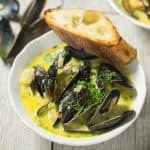 Creamy beer steamed mussels served with crostini’s to soak up the delicious creamy ale mussel and root vegetable stock. 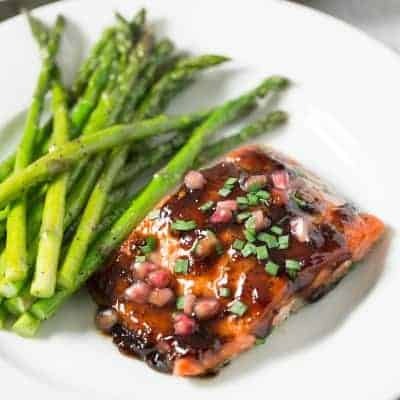 A quick and easy romantic dinner for 2. After working at a fancy steak house during college, I know that New Years is not the night to go out to dinner. It is extra crowded, which means a long wait for your food and bad service. For us, New Years is a night best spent in. Shawn and I are going to put the baby to bed, and then have a romantic night in just the 2 of us to ring in the New Year. We’ll have champagne, watch the ball drop in Times Square, and enjoy these creamy beer steamed mussels for dinner. 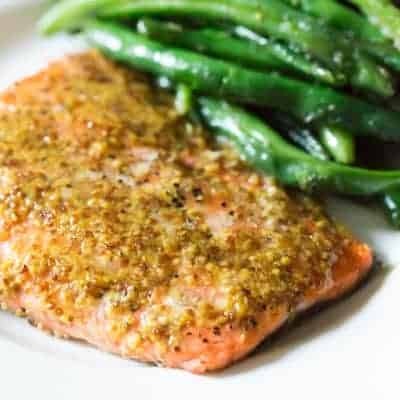 This is one of my favorite date night dinners to cook. It’s fancy. It’s delicious. And best of all it is ready in under 30 minutes. 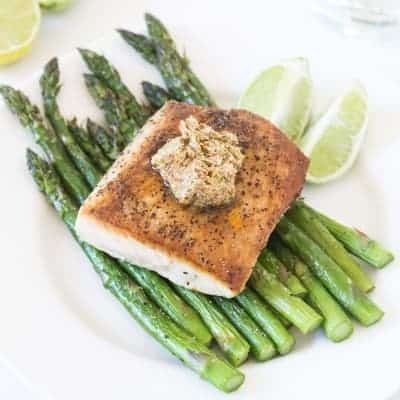 Which means more time for the at home date and less time in the kitchen. Plus, it only dirties one pot, so clean up is a breeze. If you love seafood and beer, this is the dinner for you. 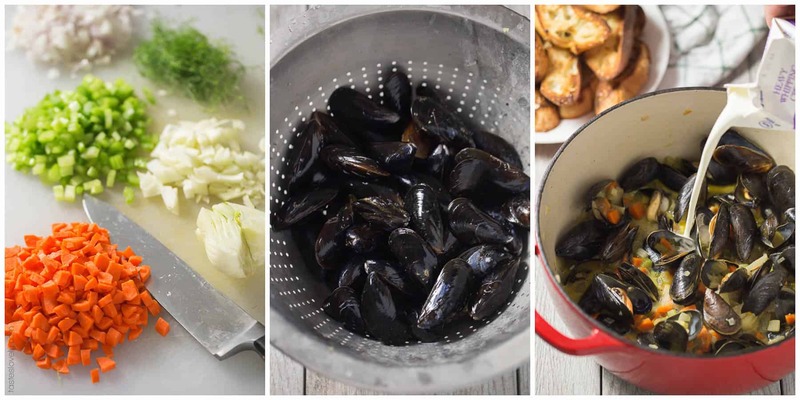 You start by sautéing root vegetables in butter, then steam the mussels in ale beer. 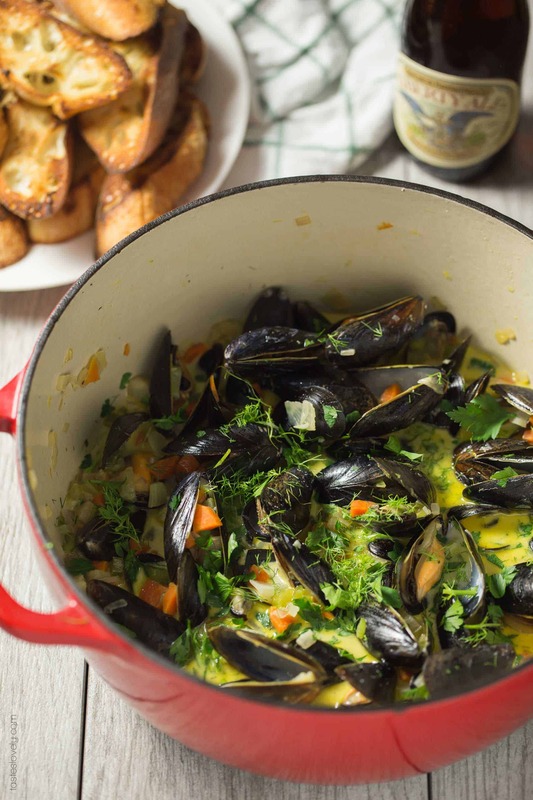 After the mussels open, you add in a little heavy cream and top it with fresh parsley and fennel fronds. So easy! 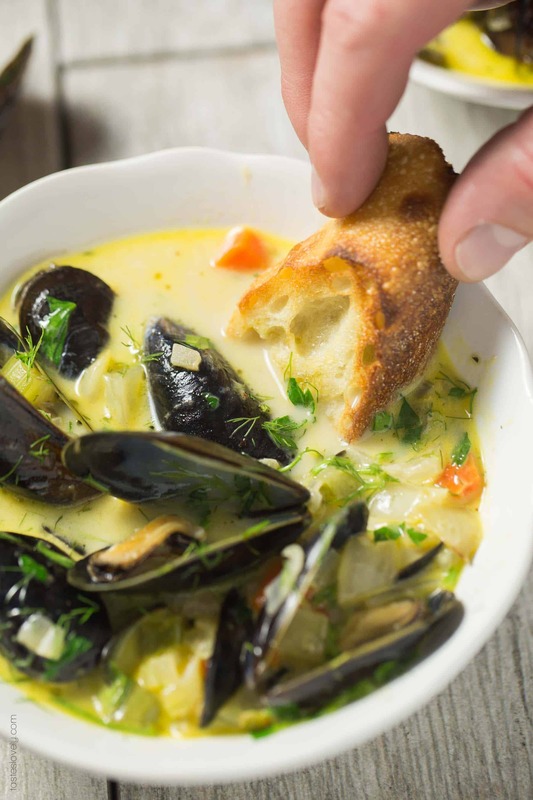 You would think the mussels would be the star of the show, but really it’s the creamy beer mussel and root vegetable stock. 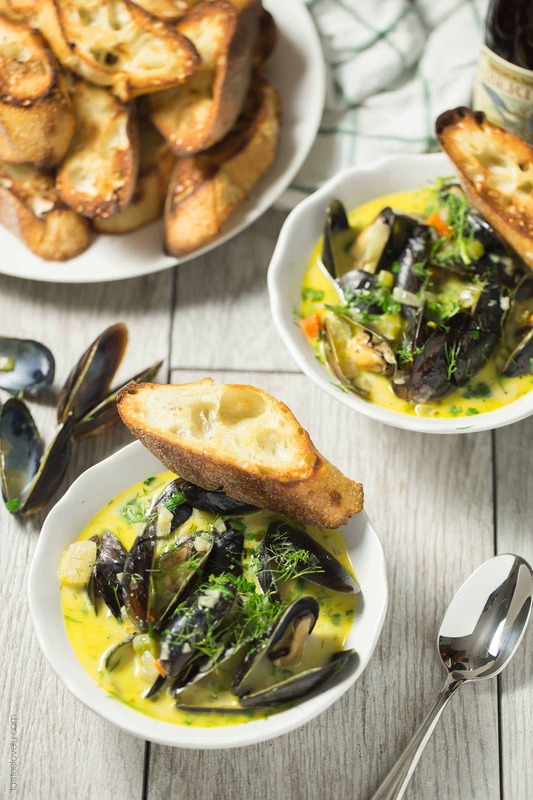 I like serving these beer steamed mussels with lots of toasted crostini’s to soak up all the delicious and flavorful stock. I like using a medium body ale. Something you enjoy drinking on it’s own. If it’s too dark and heavy it will overpower the natural sweet and briney flavor of the mussels. 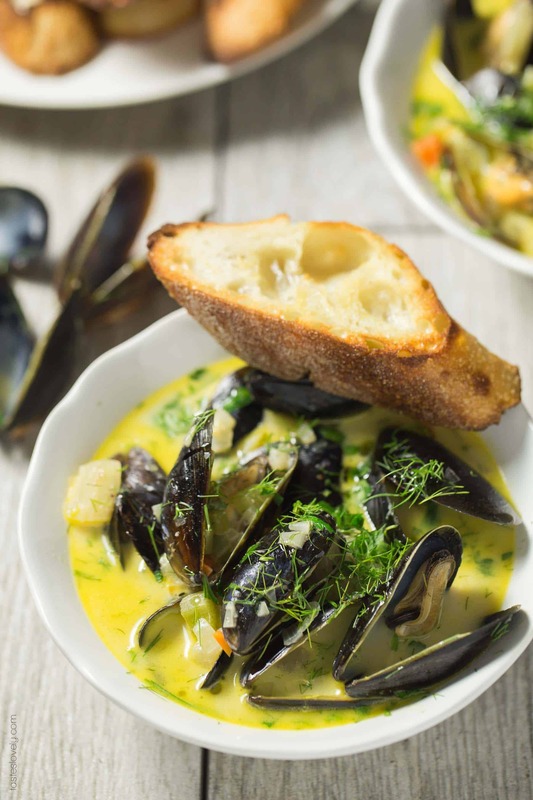 You could take the time to remove all the mussels from the shells before serving. But I actually like serving it with the mussels still in the shell. There is something very romantic about dinners where you have to use your hands. Getting all cozy and comfortable splitting open all the mussels and dunking the bread in to the creamy beer broth stock. Plus, it looks so much prettier with the mussel shells. Heat oven to Hi Broil with oven rack in the upper 1/3rd. Lay the crostini’s in an even layer, and spray evenly with olive oil. Broil for 90 seconds (or until golden brown), flip the crostini’s, spray with olive oil spray again, and broil another 90 seconds (or until golden brown). You want the crostini’s toasty on the outside, but still soft and tender on the inside. Heat a dutch oven (or large pot with a lid) over medium high heat. Melt the butter, then add the carrots, celery, fennel bulb, salt and pepper. Cook 5-7 minutes until the vegetables are soft. Add the garlic and cook 30 seconds until fragrant. Add the beer to the vegetables, keep the heat at medium high heat, and bring to a boil. Add the mussels, cover the pot with the lid, and cook 3-5 minutes until the mussels open. Discard any mussels that do not open. Turn off the heat. Add the heavy cream, stir to combine. Taste for salt and pepper and season if necessary. Serve warm with crostini’s. Garnish with parsley and fennel fronds.